The greatest single song Dream Theater ever made. That is arguable, but it isn't too far from easily acceptable, either. 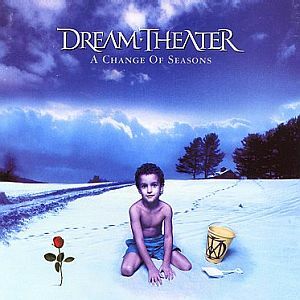 The epic title track is a definitive Dream Theater song. It had absolutely every facet of the band in that era, coalesced into one stunning monster of a song. The multiple segments range from tasteful classical guitar introductions, to powerful metal guitar screeches and soloing. Labrie performs his most convincingly in this "mini opera". The extremely catchy chorus segments seem to be culled from the bands nether region out of nowhere. Each separate section has several enjoyable moments, and the instrumental passages are breathtaking. 23 minutes of pure progressive metal splendor in full force. The lyrics are intelligent and deep, as the same can be said for the composition and execution. Not a single moment in the opus is mediocre. Dream Theater at their creative peak. One could obtain this release for the title track, alone, but there ARE other songs on here. They are live covers of a multitude of diverse artists, and Dream Theater amazingly pull it off. Funeral For a Friend captures the epic and dramatic scale of the Elton John classic, with a symphonic flair. They make it with grace and efficiency. Perfect Strangers opens with a muddy organ section, and features them at their most rocking. This is quite the ferocious track, but leaves me a bit unimpressed in the grand scheme. The Led Zeppelin medley is fine and dandy. Again, I don't prefer when they go forward into almost simple classic hard rock, but I could see where quite a many individuals could cull enjoyment from it. The second main highlight of the "EP" is the large covers medley at the end, where the boys toss out preconceived notions and toss an uncanny array of song references at us in one long mammoth finale. From Queen and Pink Floyd, Journey and Kansas, nods to many seminal bands are included, and they pull it off, exquisitely. If anythign could be said, it would be that the three middle cover tracks aren't as high quality as the title track, but that very song, and the big ending medley more than make up for it. This is a classic Dream Theater album, and a solid purchase. The quality isn't very consistent, but A Change Of Seasons is a grand accomplishment for these fellows.